Edible weeds are frequently discarded by home gardeners who are not aware of their nutritive and culinary value, simply because they are not educated about them. Have you ever wanted to eat the weeds you pulled from your yard but you were afraid to — for fear they were toxic? Or perhaps you want to eat more locally — from sources that are no further than your yard or the neighbors’. Or maybe you are a die-hard environmentalist who is concerned about the carbon footprint of your food. Perhaps none of these thoughts have crossed your mind. I mean really — who would eat dandelions, nettles or even purslane? Besides how do you know what plants are safe to eat? How do you collect and prepare what you find? 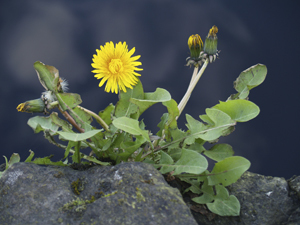 Edible weeds are frequently discarded by home gardeners who are not aware of their nutritive and culinary value, simply because they are not educated about them. The same is true for flowers. They are more than just lovely to look at; you can eat the petals of pansies, nasturtiums, stock and Johnny Jump-Ups, just to name a few. One place to find information on the plants in your area is to read up on the history of the native people and generations past. Start with the local historical society or dig into the virtual stacks of the Library of Congress — Science Reference Services — TB 96-1. You can also check for local foraging groups led by people (primarily in neighborhoods and parks) who know what to look for when searching for wild or native foods. Caution should be used, however, when collecting plants from the wild. Some of them may be toxic to the belly or can irritate the skin. Always be sure that you know what you are eating or touching. Another reason people search for and eat native and wild food — in addition to it being fun and environmentally correct — are the health benefits. For instance, many greens are high in calcium and protein. Quite often edible plants found in the wild are “pure,” meaning they have not been sprayed with any chemicals (fertilizers, pesticides or herbicides). They have not been genetically altered either, as much of the food we buy from the stores has been. In fact purslane, a common weed found throughout the world, is very nutritious. One cup of raw, common purslane is only seven calories yet provides 15 percent of the daily requirement of vitamin C and, according to the University of California Agriculture and Natural Resources, its crude protein is reported to be about 20 percent. Furthermore, the plant is one of the highest non-animal sources of omega-3 fatty acids, which have been shown to reduce the incidence of cardiovascular disease. If you forage closer to home or in any urban area be sure to know if the plants you harvested were sprayed with chemicals. Be cautious about gathering from roadsides where rainwater may have washed oils and other harmful substances onto the plants. This is one reason I like to take what is in my yard — I know what has and has not been used on them. Wherever you decide to pick, be sure to know the local laws. Here in Arizona, desert plants are food for wild animals and may not be harvested. But there is much available on public lands, at resorts and hotels, and in the neighbors’ yards that is still fairly easy to find. Just be courteous and ask before picking. Many parts of plants can be used for food, e.g., berries, flowers, leaves, seeds and roots, and often not in a way that may be familiar to you. In fact, one of the challenges with eating native or wild plants is learning how to harvest and prepare them. Today, there are many books on the subject, and people freely share recipes. Sometimes the plant can be cooked or prepared the same way as the others that it resembles. For example: Most greens (i.e., dandelions) can be cooked or used in smoothies and salads. In the desert, the selection of native foods available is unique. With little rain and high heat, you can be sure that the plants are tough to endure this harsh environment. The most well known is prickly pear cactus, known for a sweet jelly, as well as a delicious syrup used for drinks (like a prickly pear martini). Additional plants are the Tepary bean that can be cooked like most other beans and the Mesquite tree bean, which can be ground into flour for baking and other uses. There are many more freely available as well. It is fun and exciting to learn how to cook and eat new plants. After you find the plant, knowing how to prepare and use it is next. A quick Internet search will quickly bring you recipes for these unusual finds. Most often plants are used in combination with other ingredients. In the case of mesquite or carob flour (both milled from the dry bean pod off a tree), they are not used alone in baking, but are often combined with other flours. You may need to slightly modify recipes based on what you have, but consider it part of the adventure. In addition, many native plants have excellent medicinal and health applications. Did you know that you can make a tea known to remedy arthritis from the creosote bush that is found all over the desert? So keep your mind open and your weeds growing until you know whether or not you may be throwing out something that you can eat. Take the time to learn more about all of the wonderful plants that grow naturally where you live. Eating green is one of the tastiest and most practical ways to truly go green. Doreen Pollack is the Garden Goddess and owner of Down 2 Earth Gardens, providing garden consultations and coaching. Join her for gardening tips at monthly workshops or home consultations. www.down2earthgardens.com or 623-217-6038. Reprinted from AzNetNews, Volume 29, Number 1, February/March 2010.